The heritage-traveller will certainly prefer to stay in the Palace Rooms of this four-star hotel: after all, it was there that the likes of the Duke of Wellington and King Miguel of Portugal once stayed. Moreover, they say that it was here in the 14th century that Prince Pedro and Ines de Castro conducted their ill-fated love affair - an event which gives the place its name, The Estate of Tears. Its restaurant, Arcadas de Capela, boasts a Michelin star, and the building is set within extensive grounds which feature rare trees from across the globe. Indeed, two of the sequoias were reputedly planted by the aforementioned Duke of Wellington. The hotel also has its own spa, fitness centre and swimming pool. 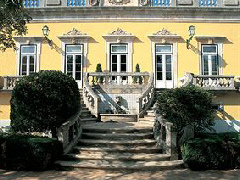 Quinta das Lagrimas is four-star rated and has 54 guest rooms in total.